Dr Annuar, Abdul Hakim (seated second and third right, respectively) and other guests-of-honour join the students and teachers in a group photo at the appreciation dinner for Klik_SPM 2016 in Sibu. SIBU: The ‘Sijil Pelajaran Malaysia (SPM) Excellence Clinic’ programme here has been receiving more participants over the past three years. Assistant Minister for Science Research and Biotechnology Dr Annuar Rapaee recalled that there were only 116 students joining ‘Klik_SPM’ when it kicked off in 2014. However, the number grew to 224 students in 2015 and last year, it gathered 314 students. In this regard, Dr Annuar assured all that the programme would continue to assist students attain good grades in their SPM examination. “Since its inception in 2014, ‘Klik_SPM’ has benefited over 600 students. “This is a free tuition programme, running for over 13 weeks, where participants learn in a varsity-like environment at University College of Technology Sarawak (UCTS). “If this were a private tuition, it would have been deemed as the biggest private tuition in town. 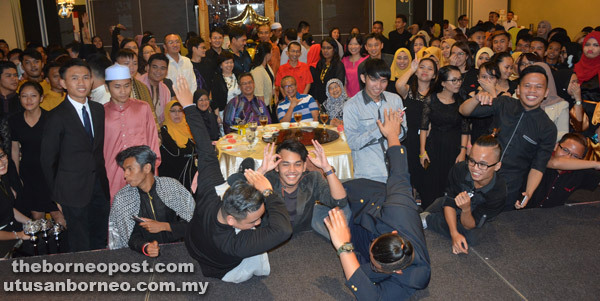 However, it is not as students need not to pay a single sen to join the programme,” he said in his opening remarks at the appreciation dinner for Klik_SPM 2016 here on Friday. The event was hosted by Sibu Bumiputera Graduates Association (PGBS) in collaboration with UCTS and Nangka Constituency Service Centre. Dr Annuar, who is Nangka assemblyman, said 18 schools were involved in Klik_SPM 2016, with 45 ‘Guru Cemerlang’ (excellent teachers) helping out. He also pointed out that the programme focused on STEM subjects – Science, Technology, Engineering and Mathematics. Speaking to reporters later, Dr Annuar said there was data on straight-A students who attended ‘Klik_SPM’. Nevertheless, he said it was more significant for the programme runner to follow up the progress of the students who took part. Moreover, Dr Annuar also stressed on the importance of English, which is regarded as the international language of globalisation. He noticed that there was a slight grade drop for the English subject in last year’s SPM in Sarawak. On this, he believed that there was still much work to be done to ensure that students could master the language. “The job market is getting more competitive than before and thus, the command of English needs to be given a priority. In this era of globalisation, there is no other way but to have a strong command in the English language – this is the way forward,” he stressed. The dinner also hosted Sibu District Education deputy officer Salemah Chali, UCTS vice-chancellor Datuk Dr Abdul Hakim Juri and UCTS Centre for Quality Assurance, Research and Development director Prof Napsiah Ismail.